There was a new course and, apart from a bit of a bottleneck at the start, it is much better than the old one. The rain held off and there was even a glimmer of weak watery sunshine. Yippee! Hardley results are below. You can see the full results here. This was the third running of the Portsmouth Coastal Marathon which is a fund raiser for the RNLI. The course starts at the Pyramid Centre and goes right round the harbour and down the Hayling Billy path to Hayling Island. Runners were seldom far from the harbour and right in it on the beach a couple of times. Then it is back by the same route. Condidtions were muddy and slippery underfoot but the scenery was interesting and the rain held off and the raucous cries of the wildfowl urged the runners on. Drinks stations were friendly and drinks on offer included mulled wine, Navy Rum and Drambuie. This would be a good one to consider next year if you want to get away from all those last minute Christmas panics. Congratulations to Katie King on her first marathon. Despite recurrence of a back injury she soldiered on and even picked up speed and started overtaking people in the last couple of miles. Hardley results are below. You can see the full results here. * included on an honoray basis although she runs under the colours of Gainsborough and Morton Striders as she is one of the Forton Village Idiots Sunday group which includes the Longparish page of the Brockenhurst chapter. the results (Excel spreadsheet) Note there are two tabs showing fastest and handicap orders. an album of pictures with thanks to all our photographers. Sue Renyard writes, "The conditions were ideal for this very popular pre-Christmas 10K as the day was dry and fairly sunny. Unforseen events caused problems for the organisers on the day, but it didn't distract from the enjoyment of the many runners. Bournemouth A.C. did well, particularly the men, winning several categories and team prizes. Most runners had booked a place in this 10k at least six months ago, such is its popularity. The extensive prize list and generous goody bag for all finishers, including a Christmas pudding, mean that many runners come back year after year. Helen Young gained a massive PB of 6 minutes faster than her previous best! Congratulations also to Chris Harris and Sue Renyard, 1st and 3rd FV60, Jan Anglim, 2nd FV65 and Nick Newton, 2nd MV55. " Hardley results are below. You can see the full results here. It was a lovely bright frosty morning for the 3rd CC6 and an excellent Hardley turnout. We started with a minute's silence for Geoff Mills which was followed by a spontaneous round of applause. Geoff was a wonderful supporter of CC6s and RR10s. We will miss him. The going was hard from the frost out in the open with plenty of muddy bits in the woods. Thanks very much to our hosts, Lordshill and Wessex for friendly and encouraging Santa marshals and some lovely cakes afterwards. I think Breton prune cake should become a permanent feature of CC6s. Hardley results are below. The full results will be on the CC6 site (see Links tab above) when they are available. It was a chilly afternoon for race 3 in this year's HCCL. Sole Hardley woman was Katie King, 89th in 35:46. Well done! Sadly that was not enough women to make a team and we are languishing is last place in the team event. Come on ladies. We have the Hampshire Championships on 5 January at Eastleigh and the next HCCL event is on 12 January at Bournemouth. There was a much better turnout for the men with seven runners in a high quality field. Hardley results are below and you can see the full results here. After this race our men are 7th in Division 2 and our vet men (same people!) are 8th in Division 1. With thanks to Katie's sister Sarah, here is a small album of pictures. John McKenzie was 78th in 72.10. You can see the full results here. It was a lovely bright cold sunny morning and conditions were almost perfect for this excellent half marathon which is part of the Hants Road Race League. Lovely views from the seafront and it is always fun to run through the graveyard of the hovercrafts. Parking and chip collection worked well, the marshals were friendly and encouraging and the was a lovely medal and a well stocked goody bag. What more could you want? There was an excellent Hardley turnout and we had full teams of both women and men. Hardley results are below. You can see the full results here. Katie King was 1077th in 2:23:19 and Caroline Street was 1080th in 2:23:29 in this ten mile plus race at Longmoor Camp near Borden. The course was muddy in parts but only the shorter runners needed to swim. You can get a flavour of it from this video of last year's race.You can see the full results here. CC6 Captain Jenny Jewell writes, "A great turnout of 88 men and 65 ladies running our own event, and also a great turnout of marshalls. This, together with a wonderful sunny morning and a particularly muddy route was a good recipe. The runners, including the front runners, looked extremely challenged after the heavy mud section followed by extremely long and slippery uphill as they emerged from the Crabhat Inclosure at about the half way point. Some of the marshalls had a pretty good run too, because getting to our positions on time was a close thing as we were slipping and sliding around on the mud as well! Many thanks to everyone involved." Hardley results are below. After the first two races our men's team are 5th and our women are equal 7th. You can see the full results on the CC6 website - see Links tab above. Here's a lovely album of pictures by Charles Fox and another by Hammy. And here are a few very atmospheric pictures from Fran Dunford; the sort of scenes runners may have missed while concentrating on the mud. Numbers were down because of injuries but four Hardley men travelled to Goodwood for the second race in the Hants Cross Country League. Results are below. After this race our senior men are 10th in Division 2 and our vets (same people!) are 8th in Division 1. You can see the full results on the HCCL site - see Links tab above. There was an excellent Hardley turnout for this HRRL race. The heavy overnight rain had eased off by the time of the start and the sun even broke through before the finish. But the rain had left plenty of puddles on the route with some being right across the road and well over ankle deep. At least it helped stop the feet from over heating. Hardley results are below. You can see the full results here. Conditions were not too good but that didn't dampen the spirits of the Hardley members who tackled the 10.2 miles of the Dorset Three Peaks Challenge. Hardley results are below. For the full results please click on the logo. Hardely results are below. You can see the full results here. For those who follow the amazing exploits of 91 year old New Forest Runner, Bruce Davidson; he completed the race in 76:06 beating his age by 15 minutes. There was an excellent Hardley turnout of 12 runners for the 10 mile Great South Run. Particular mention goes to Paul Pallister who was 40th overall and first M40 out of a field of over 17,000 and, at the other end of the field, to Annie Bruce-Low who was so weighed down by the £136.56 in her collecting bucket that she had to walk the last 4 miles. Hardley results are below. Click on a runner's name to see a bit more detail. Nick Newton made the journey to Great Yarmouth and finished a very creditable 13th place and first in his age group in 3:08:55. Well done! The full results are here. What a lovely run and the first race in Hardley colours for our newest member, Katie King. Nine miles, all off road, lovely autumn scenery, gentle undulations, good forest tracks and a bit of mud here and there. What more could you want? How about the lovely marshals encouraging you by name and the sun coming out at the finish? Hardley results are below. Congratulations to Sue who was first FV40. The full results are on the Totton RC website NB say no if you are asked if you want to update links. Feedback has been very good. A huge thank you to everyone who helped and particularly those who did so in two or three locations. Also to those brave souls who helped and then ran or ran and then helped or both. This is a HRRL race and it was great to see Hardley fielding full teams as well as organising. Hardley results are below. For the full results please see the Solent Half tab above. Please note Sue Stone was the sweeper; she's normally much faster. After the first race our men are 10 in Division 2 and our vet men (same people!) are 6th in Division 1. Hardley Results are below. The full results are here. Thanks very much to Romsey for hosting the first race. Martin Loveless reports, " Excellent turnout from Hardley for the first cc6 race at a very boggy Stoney Cross. Nice to see some new faces from the club trying out their very first cc6 race but I have to say they probably picked the hardest one of the lot! Removal of the fast runner restriction made very little difference as think there were only about 3 extra who owuld not have been eligible to run previously. Hardley results are below. You can see the full results on the CC6 website - see Links tab above. Viv Alexander writes, " Two Hardley runners were among the 40,000 entrants for the Berlin Marathon. The conditions were pretty good on the flat course, thought it got a little warm later on. There were bands playing around the course which gave me a lift and my daughters were cheering at several points to help me along. At half-way I was on 2:11 exactly and heading for my target of 4:22 but leg pain had kicked in badly at mile 12 and I had to stop at every water station to tip cold water down my leg to ease it - which slowed me down quite a bit, but I had to keep running as the pain was worse if I walked! The last 2K were really hard, you know you are really close at Potsdamer Platz but then the route goes away and there are loads of turns in the road until you eventually see Brandenburg Gate and the finish beyond. Not sure what our overall positions were as they have split it into male and female." It is good to see Sue Sleath coming back into form after a period of injury. She travelled to Ireland with a group of friends and wasa second woman in the Causeway Coast Marathon in 4:23:04. The route follows the paths, tracks, beaches and coastline of the Causeway Coast Way - probably one of the most spectacular coastlines in the whole world, passing close to the actual Giants Causeway stones. You can read more about it here. A good Hardley turnout and some excellent results. Well done! Hardley results are below. You can see the full results here. Mark Aston reports, "With the race starting and finishing on the race track at the Mountbatten Centre it helped bring some additional excitement for the 2nd Hampshire Road Race league event. There were around 500 runners in the 5 mile race as well as 130 running the 10k which started at the same time and then split off around the midway point. There was a fair amount of wind when running alongside the lake but for the most part it was fine conditions. Pretty much a flat course and definitely one to try and get a PB at." Hardley results are below. You can see the full results here. The Charmouth Challenge is the most southerly fell race in England. The 8 mile course goes through some of the finest coastal scenery in the South West. It includes an ascent of Golden Cap, the highest point on the south coast of England at 191m.It was rained off in July and the new date clashed with the HIghways and Skyways so there was only one Hardley runner, Mark Lee, M40, who was 76th in 1:26:02. The full results are here. Fantastic Race! Well done Broughton Bounders you thought of everything! Hard but enjoyable scenic nine mile course well marked with supportive marshals & drinks stations. Delicious BBQ, fine teas & cakes & even a bar! Retail therapy was handy & the massage tent a bonus! Hardley results are below. You can see the full results here. We had one runner, Annie Bruce-Low who reports, " I managed to knock 3 minutes of my time so was very pleased. It was a good day for running and managed to finish before the sun came out. Unfortunately the half marathon had the sun. Between the two runs there were over 24,000 runners. I got £38 in my bucket. One lady whilst I was waiting at the bus stop to go back to my brother's, gave me a £10 note!!! We went for a meal at night to a small local restaurant and a couple seeing me with my t-shirt on insisted on paying our bill!!! Wow what a day!" The overcast and sometimes damp weather did not dampen the spirits and, with 18 runners, we had the largest Hardley turnout for some years. There were some smashing views, challenging steps and lovely Tee shirts for all. Hardley results are below. You can see the full results here. Mark Aston reports, "Turned out to be lovely day for the 1st Hampshire Road Race League event of the year, the sun was shining down. Perfect conditions with a slight headwind during a couple parts of the course (which was reversed from last year). Seemed to be less locals out this year but still enough cheering to keep you going." Hardley results are below. You can see the full results here. Mark Aston reports, "What felt like the hottest day this year made it a tough but enjoyable race along mostly quiet country lanes. A good turnout from the friendly locals who encouraged everyone round". Hardley results are below. You can see the full results here. Hardley results are below and here's a link to Hammy's lovely pictures. The full results for this race and the whole season are on the RR10 site on Thursday evening (see links tab). Congratulations to Lisa Lewis, Annie Bruce-Low and Mark Lee who took part in all the races. Clearly having a name beginning with L is an indicator for persistence. We had four four runners and four category winners on a very hot day. Guy Brown was first M45 in the 50K. John Mckenzie was first M55 in the 42K and Jeff Mills and Annie Bruce-Low were first M80 and F70 in the 10K.Well done all! Hilarious, hair-raising, slip, slide and squelch experience! A 13 mile race over tracks, paths and quiet lanes and taking in the beautiful countryside on the Sussex/Surrey/Hampshire border around the village of Milland. The terrain is hilly and the race is particularly tough but the views more than make up for the pain! Hardley results are below. You can see the full results here. It was a lovely summer evening and Lordshill gave us an excellent course, well marshalled. Thank you. Hardley results are below and here's a link to Hammy's lovely pictures. The full results are on the RR10 site (see links tab). Well done to Matthew White, sole Hardley entrant, who finished 101st in a new PB of 1:36.31. He reports that it was a relatively flat course on scenic country lanes around Sturminster Newton. Great organisation and nice cakes!! at the finish. Sounds like one for a few more of us to do next year. You can see the full results and pictures here. Great scenery, well organised and excellent value for money. Hardley results are below. You can see the full results here. There was very heavy rain around Winchester and Southampton which slowed traffic to a crawl. Maybe that is what reduced the turnout a bit. The showers had clearly come from Janesmoor where the rain had stopped and the air was fresh and clear but the ground was more than a little wet. In fact, if truth be told, it was seriously muddy in places. That made it a lovely course for those who like serious mud but not so good for those who don't. Marshalling was good and the sunset afterwards was lovely. Thank you Wessex and Romsey. Hardley results are below and here's a link to Hammy's lovely pictures so you can re-live the run. The full results are on the RR10 site (see links tab). Mark Aston writes, "Thanks to Eastleigh for organising the inaugural Wyvern 10k road race. Plenty of marshals and a good turnout from the locals. The weather was perfect, only a few puddles left over from the recent downpours. Race started and finished on the running track at Wyvern Technology College which added to the excitement. Course was mainly flat and definitely a race to get a PB at." Hardley results are below. You can see the full results here. It was an early alarm call to get to Swanage for the 9.30 start and, as usual for this excellent race, it was worth it. The scenery was geat, the hills were punishing and the rain held off until mile 6 when it was welcome for its cooling effect. Hardley results are below. You can see the full results here. Hardley hosted this event at Southampton Sports Centre. Chris Harris reports, " Even though it poured with rain, it didn't go down like a wet squid !!". You can see her pictures here. The full results both team and individual, are here (Excel spreadsheet). As Romsey were the winners they will be hosts next year. The fastest men were Tom Stevens (Eastleigh A), Matt Hammerton (Romsey A), Paul Cardy (Romsey A) all on 4.48 and the fastest woman was Amanda Hull (Romsey D) on 5.31. Another excellent Hardley turnout. The course was good if a trifle wet under foot and the marshals were both cheerful and efficient. Thank you Eastleigh. Hardley results are below and here's a link to Hammy's lovely pictures so you can re-live the run. The full results are on the RR10 site (see links tab). Geoff Mills was the only Hardley competitor and finished in 268th place in 68:05. As you get older the challenge is to do 10K in less than your age. Geoff did that with 12 minutes to spare. Well done! There was only one Hardley competitor in this 24 hour endurance event. It started at noon and finished at the end of the lap you were on at noon next day. David Gould was 9th solo man completing 100 miles in 24:13:39. Well done; this bodes well for the Lakeland 100 at the end of the month. You can see the full results here. There was an excellent Hardley turnout with 36 members running. Memo to any of the 36 who have not got round to renewing membership - please click here to do it now. The course was good, a mixture of gravel tracks and grassy forest rides. A bit muddy in places but we had been warned and it has been more than a little wet recently. Thank you very much to our Totton friends for your cheerful and efficient marshalling. Also to the unsung Hardley heroes who do the results, transport the tent and so on). Hardley results are below and here's a link to Hammy's lovely pictures so you can re-live the run. The full results are on the RR10 site (see links tab). An excellent course and very well marshalled by our Stubbington friends. Some unexpected mud and puddles; must remember the trail shoes next time. Numbers were down a bit so perhaps the distance put some people off. Hardley results are below and here's a lovely album of photos by Hammy. The full results are on the RR10 site. Don't forget that the next RR10 is only at week away, at Brockenhurst. There was a good Hardley turnout for this popular 5 miler organised by our Romsey friends. Hardley results are below. Congratulations to Mick and Jan Anglim who were both first in category. You can see the full results here and here's a photo album. Martin reports that the race was, " well organised , low key, very friendly and very, very undulating". Hardley results are below. You can see the full results here. The course was a bit soggy this year with 5 inches of rain falling in the 24 hours before the start. As a results an extra mile was added to ensure a safe crossing of a swollen river. First Hardley finisher this year was on horseback. Well done to Sue Stileman and Rowdon Gambler. As well as an excellent race it was an excellent social weekend with re-hydration on the Saturday night in the traditional Hardley way. Why not give it a try next year. To find out more just ask anyone who went.Hardley results are below. You can see the full results here. Click on the small picture to see more pix. Here's a video from Jason at Chineham Park. You will note the exceptionally handsome runner in the sequence beginning at 4:43. And here's another from the horse's point of view. Sue Stone had a bad fall at mile 10 and injured her leg. She then fell in a bog and was rescued from its thigh deep clutches by a knight in shining armour. "Thanks very much to the very nice man from Headington Road Runners Oxford who gave assistance when I fell, rescued me from a thigh deep bog and kept with me until the finish. Shows what nice people runners are"
The course was a new one; challenging without being dangerous. It wound through woods and fields and sometimes alongside the River Hamble. The going underfoot was firm with a bit of mud here and there to make it more interesting. The marshals were excellent. Thank you Running Sisters and Halterworth. There was a good Hardley turnout. Our results are below. The full results are on the RR10 site (see Links tab above) and here are Hammy's excellent pictures. The route follows the stunning Taff Trail from the Brecon Beacons National Park all the way to the finish at Sport Wales. Martin comments, " unfortunately too much tarmac for my liking so feet are a bit battered and bruised but we all made it back to the finish." Hardley results are below. You can see the full results and some pictures here. Click on the small picture to see the team. This year ’s sell out Marwell 10K saw a field of 840 runners line up to take on the challenge of the hilly but lovely course around the park and the surrounding lanes. Hardley results are below. You can see the full results here. There was one Hardley runner, Mark Aston, who finished 584th in 42:36. Well done! The full results are here. It was a lovely day for this very scenic run with a choice of 20 miles or 33. The views and scenery were excellent, particularly the beech wood early on where the trees were in new leaf and the ground was a mass of bluebells. The path was somewhat muddy though. Good job it was a diversion from a really muddy path. Hardley results are below. You can see the full results here. Swiss based Hardley Runner Graham Macfadyen ran the Geneva half in a very creditable 1:17 and finished 10th in his age category and first Brit. Well done! Amy Tanner ran her way into the Guinness Book of World Records as the fastest school girl. She is raising money for Festival Samaritans and British Heart Foundation. If you'd like to sponsor her then here's her web page. Conditions were good - cool, bright and sunny for the start and then gradually clouded over but the forecast heavy showers held off until after the finish. As always the crowd were very supportive. Hardley results are below. You can see the full results here. The April showers did not deter anyone and numbers were about the same as last year. Luckily the rain stopped for the run. The course was lovely and muddy. Last year's innovation of a stretch on the beach was included again which was fun. Hardley results are below. Here's a lovely set of photos from Hammy. The full results are on the RR10 site (see links tab above). Hardley Runners' newest member, Guy Brown, sprinted across the finish line to claim 198th place. With a clock time of 3:13:01 and a chip time of 3:12:49, he set himself a new personal best, but it may not stand for long as he has a confirmed entry in October's Abingdon marathon. Two energy sapping hills, challenging woodland trails and a great view over Hurstbourne when you emerge from the woods. An excellent course made even more interesting by the recent rain. Oh and there were great cakes and bacon butties. What more could you want? A bagpiper? Yes there was one though he was probably for the wedding at the church near the start. Free fun run for kids? There was one. 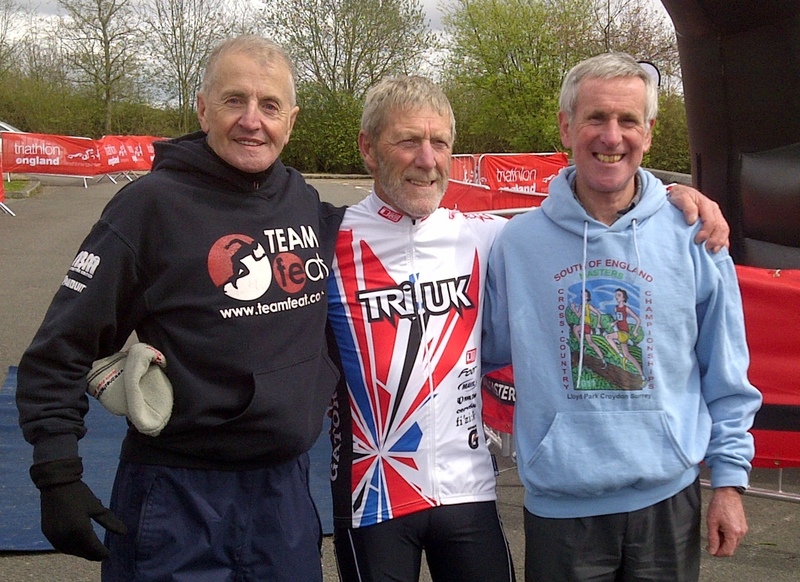 David Gould was 31st (3rd M50) in 41:13 and Geoff Mills, the oldest runner, was 115th in 59:52. You can see the full results here and if you click on Geoff you'll find a small picture album of Hardley and friends. There's lots more information and pictures on the race Facebook pages. A nice low-key 8 mile race held over 'challenging' terrain and the windy weather made it even more interesting coming over Tennyson Down. Hardley results are below. Congratulations to category winners Viv and Mick, pictured aside. You can see the full results here. There's a lovely album of pictures on the Ryde Harriers website which includes all our runners. You can even download the full size originals if you want which is very kind of them. 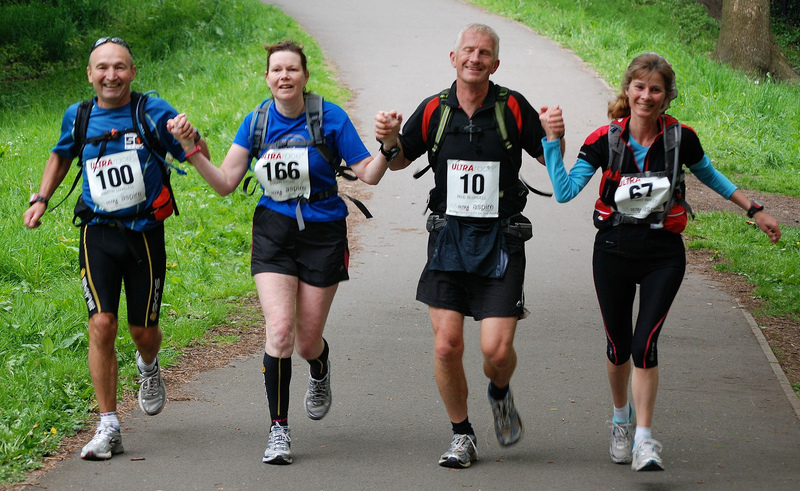 A scenic event run mostly on tracks, footpaths and bridleways. Terrific value with a great T shirt and a full meal after. Hardley results are below. You can see the full results here. Congratulations to Sue, John and Peat who were first mixed team. There was an excellent Hardley turnout of 32 runners for the Club Championships. We were blessed with fine weather and the good course gave everyone the chance of a good time. Hardley results are below. Congratulations to Sue Sleath who was 2nd F45 and Tiff Hanley who achieved a new 10K PB by 2 mins and 13 seconds. You can see the full results here. And here's a lovely set of pictures by Hammy. Thanks very much to all the members and friends who helped to make the Exbury 10K such a success. For the full results and pictures see the Exbury 10K tab above. Hardley results are below. Congratulations to out men who were first team, to Paul Ashley who was first overall and to Malc Renyard who was first MV60. These once a month 5K races are held through the winter along the front at Boscombe. Malc Renyard won the over 65 series of 6 races, with Howard Doe (2nd claim Hardley) winning the over 60 category and Mick Anglim coming 2nd. Well done! Well another season is over and after the final race we have the overall results. Our men were fourth, our women were fourth and our combined team was third. Thanks very much to everyone who supported the series whether by running, marshalling or actively spectating. Hardley's Sue Sleath won the over 40 age group and finished 2nd overall. Chris Harris won the ladies over 60 age group and Mick Anglim won the mens over 60' s. Well done all. There's more information on the CC6 website (see Links tab above). There was a good Hardley turnout for this HRRL race which follows a scenic route north of Salisbury along the banks of the River Avon through the gently undulating Woodford Valley with fine views of the cathedral spire on the return leg. Hardley results are below. After this race our men's and women's teams are both sixth in Division 2. You can see the full results here. Forget those corporate pretender 'hard man' events; this was 20.5 miles of the real thing as nature intended and with stunning views. The organisation was impressive and flawless; they may have even been responsible for arranging the glorious sunshine. It's the people that make this race truly special, the countless grinning marshals, bagpipe players, bands, drummers, banners, signs, amazing support, and silly or inspiring comments nailed to trees. A sense of humour flows from every pore of this race. When you do finally finish you get a great technical T-shirt and the option of getting hosed down by the fire brigade or running straight into the sea. Oh, and the icing on the cake was an individual handmade cupcake iced with the number '25' to mark the anniversary of this event. A very enjoyable off road half despite mud and cold wet weather. Thank to all the organisers and marshalls who did a great job in rotten conditions. Hardley results are below. Congratulations to Mark who was first MV40 and age adjusted first man. You can see the full results here. What a change from the previous CC6. This time it was very wet and very muddy at Fleming Park but overall turnout was the second highest of the season. Not so for Hardley, what with lots of members being on the Youth Hostel weekend and the poor weather numbers were down. Hardley results are below. The full results and lots of excellent photos are on the CC6 site (see Links tab above). Only one Hardly runner so far as I can see. Well done John McKenzie who was 3rd MV55 and 66th overall in 41:39. The full results are here. We had a good journey, sharing a minibus with friends from Totton. And what a lovely day it was. We arrived to bright warm sunshine and it stayed that way for the whole afternoon. The going was good with very little mud and it was wonderful to be among the best of English runners. Sadly we didn't quite have a team (six needed for the men and four for the women) but those who were able to come had a thoroughly enjoyable race, 8K for the women and a rather short 12K for the men. Hardley results are below. You can see the full results here. What a change a week makes. It was good Hardley turnout on a lovely sunny morning for the CC6 and our Totton friends put on an excellent course with hills, plenty of mud and a couple of streams to cross. On such a lovely day it was one of those runs that makes you glad to be alive. Hardley results are below. The full results and lots of excellent photos are on the CC6 site (see Links tab above). A 21 mile multi terrain race around the Meon Valley with a new course which included quite a lot of the previous one. Leg-crumbling hills make this a punishing race and boy was it hard work this year! Last year Paul described the course as being slippery as a skating rink. This year, in parts, it was a skating rink. The ground was frozen but the air was warmer with the result that a melted layer lubricated the ice underneath. One consequence was numerous slips and your webmaster came a cropper twice. Ouch! Aside from that the new arrangements worked well, parking was much better than the pre-race publicity suggested and the course was both challenging and scenic. All in all a real cross country which all six of our runners used as training for ultras later in the year. Hardley results are below. You can see the full results here. And here are lots of lovely pictures. There was a good turnout from our men for a very chilly cross country race of around 10K on Hudson's Field in Salisbury. This was the last race of the season and our men finished the season 5th in Division 2. Our veteran men (mostly the same people!) were 7th in Division. Well done and thank you very much to everyone who has turned out to represent our club this year and to our captain, Ian Banks, for all his encouragement. Let's hope we can keep up the good work next season and encourage the women to race as well. Hardley results are below. You can see the full results here. The Club helped with transport costs for this HRRL event. Thanks very much to everyone who turned out; twice as many as last year. Hardley results are below. You can see the full results here and here's an excellent photo album. The next HRRL event is the Bramley 20 which is ideal training for those planning a Spring marathon. It is too late to enter Bramley, however, so how about the Meon Valley Plod, another race with excellent refreshments and they even have a jet wash to clean you up at the finish. While most competitor were at Ryde, on the mainland there were Hardley runners in a couple of other races. At the Chichester 10K John McKenzie was 207th in 41.37 and Geoff Mills was 1390th in 70.37. Full results here. And at the Blackmore Vale 1/2, an undulating rural course with lovely cakes, Jeremy Barber was 343rd in 1.55.45. Full results here. AS always there was a good turnout for this excellent event organised by the Amesbury walkers. You can choose 10k, 20k, 30k or 40k and there are checkpoints every five miles or so where you can get a drink and a biscuit to keep you going. Runners are welcome and there were lots there. Times are not published as this is a walking event. The only drawback this year was the weather which was dreich as our friends north of the border would say. On Saturday 28 January 8 intrepid Hardley Runners headed off to Stanmer Park, Brighton. It was the place to be on Saturday, an open day at the University and a FA cup match at Brighton’s new football ground both within spitting distance ensured that parking was at a premium. Our expert driver, Mick, managed to find a parking spot within a short distance from the venue and a leisurely course reconnoitre was undertaken in cold clear conditions with a brisk northerly wind. The course was a mix of rolling grass land with chalky paths within the woodland on the side of a hill and the going was mainly good to firm with some slippery chalk and mud. The men were to run 15k (3 big laps plus a start loop) and the women 8k (2 medium laps plus a start loop). The courses for both races being on the glorious South Downs were challenging with hardly a level spot to be found. This was definitely not a parkland race! This was one proper cross country course definitely a bit tougher than average but a worthy course for a regional championship event. Our ladies went off first. The ladies at the front were impressively rapid, well done to both Amy and Linda for competing in a classy race and finishing with style. The men’s race was off whilst the ladies were still out on the course, the short start lap spread the field out due to a couple of tight corners and a little hill; the leaders were out of sight by the time mid-pack had ascended this first little hill. The boys at the front were as impressive as the ladies. The mens race had a sprint finish, we could hear the excited commentary on the PA as the mid pack was starting their final lap. The winning time was impressively fast at just over 49minutes. The Hardley contingent, being of more senior years were a little slower! Well done to all the six finishers, meaning that we completed a team coming a creditable 73rd one place in front of local rivals from Totton . Here is a small album of pictures and you can see the full results here (or at least you will be able to if SEAA have published them; there is some discussion on various blogs about why it takes them so long when the results of each race were on sale in hard copy within ten minutes of the finish of the race concerned). Next Championship race – The National XC on 25th February at Parliament Hills. The Rough and Tumble is a 10 mile off road event that starts and finishes in the village of Milton Lilbourne, near Pewsey, Wiltshire. This is advertised as the toughest race in Wiltshire, which it probably is as it takes in one of the steepest ascents and descents in the area. Thanks to the recent dry weather, the course was not as treacherous as last year when the mud made for descents only accomplished by sitting down! The villagers are well known for their cake making abilities and all runners could look forward to a well earned cup of tea and piece of cake when they finished. The weather conditions were ideal although cold, with sunshine all day and some lovely views of the Vale of Pewsey to be enjoyed on the way round. Martin Loveless reports, " Dreadful choice at the finish - go for the tables laden with home-made cakes or the bacon sandwich tent, what a horrible decision to make but easily solved in the end by simply going for both." As with the Rough 'n' Tumble, it was perishingly cold to start with but 15 Hardley members braved the frost and enjoyed some lovely views of the sea at Hill Head. The was an HRRL race so well done to our Vet Men teams who were 8th and 22nd and to our Vet Women who were 25th and 51st. Hardley results are below. You can see the full results here. A good Hardley turnout and an excellent course on an overcast morning. That final hill is a killer though. Hardley results are below. The full results and lots of excellent photos are on the CC6 site (see Links tab above). 27 Mark Causebrook S 61 John Locke 82 Geoff Mills Super V!